Let’s put Congress on a budget!!! Let’s put Congress on a budget!!!! I have done everything in my power to get the federal Senators and Representatives to cut spending. It is obvious to me that if President Obama gets his hands on more money then he will continue to spend away our children’s future. He has already taken the national debt from 11 trillion to 17 trillion in just 5 years. Over, and over, and over, and over, and over and over I have written Speaker Boehner and every Republican that represents Arkansans in Arkansas before. What if you had no spending limits this holiday season? This is basically how Washington spends your money. While you’ve been planning your expenses carefully, Congress hasn’t had a proper budget in years. It just keeps tacking on spending. That’s why the 2.5 percent budget cut Congress agreed to a couple of years ago was so important. The credit cards are beyond maxed—we’re more than $17 trillion in debt. These are only the beginning. In fact, Heritage experts have helpfully identified outdated or unnecessary government programs that could be eliminated so Congress could save $42 billion of your money. So let’s not hear that there’s nowhere to cut. It’s time for budgeting—and staying within that budget. I know that you receive 20,000 letters a day and that you actually read 10 of them every day. I really do respect you for trying to get a pulse on what is going on out here. It is truly sad to me that so much of our money is taken by the federal government. Our founding fathers believed in small limited government. It seems that our President wants to play Santa Claus. At the rate the federal government spends, it runs out of money on July 31. What programs should be cut to balance the budget and fund the government for the remaining five months of the year? Cutting NASA might buy two days; cutting the Navy could buy fifteen. It seems that balancing the budget may require more than just cutting government programs. What should be done? Make ’em be bureaucrats and fed’rals and such. Libertarians developed a pre-Marxist class analysis that divided society into two basic classes: those who produced wealth and those who took it by force from others. Thomas Paine, for instance, wrote, “There are two distinct classes of men in the nation, those who pay taxes, and those who receive and live upon the taxes.” Similarly, Jefferson wrote in 1824, “We have more machinery of government than is necessary, too many parasites living on the labor of the industrious.” Modern libertarians defend the right of productive people to keep what they earn, against a New Class of politicians and bureaucrats who would seize their earnings to transfer them to nonproducers. President Obama plays Santa Claus but you played for the presents!!! During previous Christmas seasons, I’ve shared some holiday humor. A tragic story of Santa Claus getting arrested by the IRS. This year, let’s enjoy a bunch of good cartoons. Lisa Benson start our list, with this recognition of Time’s Man of the year. It’s so nice of the President to give away other’s people’s money. And since Obama’s currently threatening to take the nation over the fiscal cliff unless he gets some class warfare tax policy, this Lisa Benson holiday cartoon from last year is worth sharing as well. The second cartoon has the same theme. The magnificent Chuck Asay offers this gem, with a message similar to one he produced earlier this year. Asay also did a Christmas-themed cartoon last year. Jerry Holbert provides this funny – but not so funny if you think about it – cartoon. Here’s a good one from Glenn McCoy. This cartoon is a pretty good summary of how politics really works. P.S. Here’s a bonus section. I can’t resist being a proud dad and sharing this family photo. It was taken while we had a meal break during some Christmas shopping. Not a bad brood, if I can offer an unbiased assessment. My kids have made other appearances on the blog – here, here, here, here, and here. I love the works of Francis Schaeffer and I have been on the internet reading several blogs that talk about Schaeffer’s work and the work below by R.C.Sproul was really helpful. Schaeffer’s film series “How should we then live? Wikipedia notes, “According to Schaeffer, How Should We Then Live traces Western history from Ancient Rome until the time of writing (1976) along three lines: the philosophic, scientific, and religious. He also makes extensive references to art and architecture as a means of showing how these movements reflected changing patterns of thought through time. Schaeffer’s central premise is: when we base society on the Bible, on the infinite-personal God who is there and has spoken, this provides an absolute by which we can conduct our lives and by which we can judge society. Here are some posts I have done on this series: Francis Schaeffer’s “How should we then live?” Video and outline of episode 10 “Final Choices” , episode 9 “The Age of Personal Peace and Affluence”, episode 8 “The Age of Fragmentation”, episode 7 “The Age of Non-Reason” , episode 6 “The Scientific Age” , episode 5 “The Revolutionary Age” , episode 4 “The Reformation”, episode 3 “The Renaissance”, episode 2 “The Middle Ages,”, and episode 1 “The Roman Age,” . Jesus gives a reason for good cheer. He was not a first-century Good Humor Man spreading sweetness and light with saccharin frivolity, singing, “Pack up your troubles in an old kit bag and smile, smile, smile.” His exhortation to joy was based on a real triumph, an ultimate victory He achieved over the threatening forces of chaos. By contrast the existential cry to courage is based on nothing. It recognizes an ultimate triumph of chaos and clings to an irrational courage. Albert Camus understood this tension when he said that the only serious question left for philosophers to discuss was the question of suicide. The contradictory character of existentialism was mirrored in the protest movement of the youth counterculture in the sixties. Two slogans became popular: “Do your own thing!” and “Tell it like it is!” On the one hand there was a massive revolt against traditional values and a call to radical subjectivism. The subject does his own thing. There are no objective norms to obey. On the other hand the summons to the older generation was to objective truth telling. “Tell it like it is!” The slogan suggests that there is such a thing as objective reality, what Francis Schaeffer called “true truth.” The youth were angry with their elders for being hypocrites, for living contradictory lives. At the same time the young people were exalting the “virtue” of living contradictory lives. The contradiction appeared at another level. At the same time the students were denying classical personal ethics by embracing the sexual revolution and the drug culture, they were screaming for a loftysocial ethic with respect to civil rights, world peace, and ecological balance. They wanted a world with love including “free love” with no private responsibility; a world without killing, except for unborn babies, and a world where the environment was pure of toxic substances, except for the ones they used on themselves. With the impact of existentialism on American culture a serious attempt was made to achieve a synthesis between Christianity and existentialism. Instead of looking to the pessimistic heroes of the movement, the nineteenth-century philosopher Soren Kierkegaard became the focal point of interest. Kierkegaard was seen as the father of Christian existentialism. Kierkegaard’s emphasis on personal passion struck a chord in the hearts of Christians. He differentiated among levels or stages of life. The level where most people live is either at a moralistic one or what he called an “aesthetic” level. The aesthetic level is the stage of the observer or the “spectator.” The spectator looks at life but stays on the sidelines. He avoids passionate involvement in life. Kierkegaard understood profoundly that Christianity is not a spectator sport. It demands passionate commitment. Christianity can never be reduced to cold, abstract creeds, or rational systems of doctrine. Truth is not always found in neat packages. It is often paradoxical, according to Kierkegaard. He spawned on the one hand a renewal of personal commitment to Christ, of Christians plunging into the work of Christ with passion. He also spawned a movement in theology that exalted the irrational. The contradiction became not only acceptable to theologians, but desirable. “Systematic” theology suddenly became suspect because it sought a kind of consistency and coherency that left no room for contradictions. The orthodox man was aware that contradictions are unintelligible. No one can understand them, not even dialectical theologians. When we use them we are revealing our confusion, not our brilliance. A final element that grew out of religious existentialism was a new stress on human personal relationships. Martin Buber, a Jewish philosopher, stressed the importance of what he called, “I-Thou” relationships. People are not things. They are not impersonal objects to be studied dispassionately. They are not numbers. We use things. People are not to be used. When I relate to another person I am not relating to an “it.” Human relationships are to be subject-subject, notsubject-object. Here was a solid protest against the widespread depersonalization of culture. The theologians who sought to combine existentialism and Christianity gave us a mixed blessing. They were correct in seeing that Christian faith demands personal passion. They were correct in stressing the personal element of human relationships. They were correct in seeing that the Christian faith is more than rationality. Sadly, however, too often they threw out the baby with the bath water. Their protest against rationality became too severe. Their antisystem perspective began to wallow in contradiction. Surely Christianity is more than rationality. But it is not less. This is part eleven of R.C. Sproul’s book Lifeviews first published by Revell in 1986. In this series we are learning how Christians are called by God to make an impact on culture and society. Are guns or governments more responsible for killing people? Nope, the answer isn’t smoking. Or fatty food. Or 16 oz. sodas. And it’s not alcohol, driving too fast, or standing between politicians and a TV camera. Why is murder “chic” for some people? In the past 100 years or so, the biggest cause of premature death has been government. Back in 2011, while criticizing the Baltimore Symphony for using the Soviet hammer and sickle in a promotion, I linked to a website showing how many millions of people were murdered by the dictators who ruled the Soviet Union. You’ll find similar data in this video, as well as some equally shocking numbers for other examples of democide (death by government). I don’t know if all the numbers in the video are right. I don’t even know if the government bought 1.6 billion hollow point bullets. And I certainly hope our tax dollars didn’t help finance Pol Pot’s democide in Cambodia. But I fully agree that government is the greatest killer of all time. This doesn’t mean, by the way, that I think all governments are equally evil. I wouldn’t even make the claim that there’s a link between big government and democide (though that’s probably true given the track record of National Socialists in Germany and Soviet Socialists in China and the Soviet Union). Instead, I’ll simply regurgitate some of what I wrote back in August. …be thankful that there are some libertarians willing to raise a stink about government even if the rest of the world thinks we’re a bit odd. As we’ve seen dozens of times, most recently with the IRS and NSA, bureaucrats and politicians have a compulsive tendency to grab more power and make government more intrusive. …I’ll end today’s post by mentioning the fable of the frog that gets put in a pot of water and doesn’t jump out because the temperature feels comfortable. But then the heat is slowly raised and the frog no longer has the energy to escape when he finally figures out he’s being cooked. Well, libertarians are the ones who loudly complain when the government puts us into pots. In other words, governments are less likely to do really awful things if there are some of us fighting when they do mildly bad things. Don’t forget that when enough mildly bad things occur and you get economic stagnation, one result is the kind of social chaos and rioting that has occurred in some European nations. And those are the conditions that sometimes lead to takeovers by the types of governments that do really awful things. Let’s close with two bits of satire. First, here’s something I saw on Twitter. 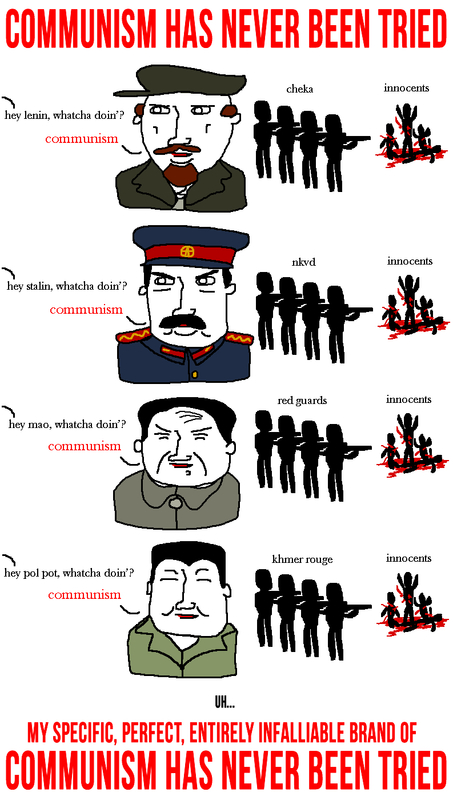 It’s for the statists who claim that communism is a good theory, but that it hasn’t been properly implemented. Needless to say, I can’t see the appeal of a theory that says we are slaves to each other. But the point of this poster is that real-world communism is always about murder and oppression. Second, this is a good opportunity to emphasize one of the messages from the end of the video. A common trait of dictators is that they want the citizenry disarmed. This poster is the fourth-most viewed post I’ve ever produced. But not because I said anything clever. Instead, people like this poster and share it with their friends because it makes a very important point about the dangers of unlimited state power. So what’s the moral of the story? I guess the message is that small government is tolerable. Medium-sized government is bad. And unlimited government is horrible. P.S. I suppose this shouldn’t be a joking matter, but here’s an amusing look at communist efficiency from the Beijing Olympics. P.P.S. And the fourth video at this link has some great examples of Reagan’s use of humor against communism. The budget deal reached between Patty Murray and Paul Ryan does nothing to reduce the debt or even the deficit by an significant amount. It does nothing for entitlement reform or tax reform. The deal breaks the sequester cap of $967 and increases spending to over #1 trillion for each of the next 2 years. The deal is just a steady as she goes kind of bill. In the bill there is a proposal to extract $26 billion from air travelers – air travelers are taking the hit in this bill. I am so sad about the Republicans caving in and letting President Obama and the Democrats get rid of the Sequester spending cap limits!!!! I have contacted my Representatives and Senators and told them what I wanted them to do. I am happy to report that Tom Cotton and Rick Crawford voted in the House to keep the Sequester limits. I AM SO PROUD OF THEM!!!!! THE NEW BUDGET DEAL OF DEC 2013 IS: Promises of fictitious spending now instead of real spending caps!!! We got to cut spending increases like the Sequester was doing in order to control government spending!!! The Sequester works so why are the Republicans giving it up? If you really want to cut the growth of government spending then keep the sequester in place!!! The Sequester actually did help control the growth of government and hopefully we can cut deeper this time around!!! I saw Amy Grant perform in Little Rock around 1991 in Barton arena with Kim Hill opening. Actually I went to high school at ECS in Memphis with Kim Hill and we were on the same track team. In fact, both the boys and girls track teams won conference championships several times while we were there. Album: Age To Age (1982), Myrrh Records. Winner of Best Gospel Performance, Contemporary in 25th Annual GRAMMY Awards. Why’d I have to get away? That hides behind a mask? Know that He loves you, once more…. The superb Michael W.Smith and lovely Amy Grant feature in concert in 1985 singing “Friends”. Gary Chapman’s there somewhere too. I know that you receive 20,000 letters a day and that you actually read 10 of them every day. I really do respect you for trying to get a pulse on what is going on out here. I have a pro-life point of view because I am a Christian and I base my views on an interpretation of the Bible. Francis Schaeffer’s teachings probably influenced me more in this area than any other person. In 1979 he teamed up with Dr. C. Everett Koop and put together the film series WHATEVER HAPPENED TO THE HUMAN RACE? and here is the first episode with covers the issue of abortion. Since you are also a Christian Mr. President I thought would take a great interest in what they had to say. Below you will see more about my pro-life views and also Schaeffer’s view that we are morally dead and in need of a savior. 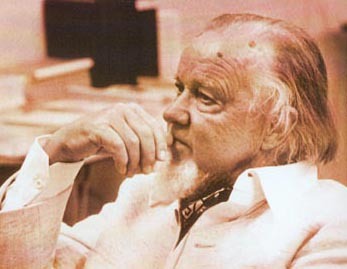 I love the works of Francis Schaeffer and I have been on the internet reading several blogs that talk about Schaeffer’s work and the work below was really helpful since it talks about making someone realize that we are helplessly dead without a savior. So many people think they are saved when they are just depending on their own works to get them to heaven.Schaeffer’s film series “How should we then live? Wikipedia notes, “According to Schaeffer, How Should We Then Live traces Western history from Ancient Rome until the time of writing (1976) along three lines: the philosophic, scientific, and religious. He also makes extensive references to art and architecture as a means of showing how these movements reflected changing patterns of thought through time. Schaeffer’s central premise is: when we base society on the Bible, on the infinite-personal God who is there and has spoken, this provides an absolute by which we can conduct our lives and by which we can judge society. Here are some posts I have done on this series: Francis Schaeffer’s “How should we then live?” Video and outline of episode 10 “Final Choices” , episode 9 “The Age of Personal Peace and Affluence”, episode 8 “The Age of Fragmentation”, episode 7 “The Age of Non-Reason” , episode 6 “The Scientific Age” , episode 5 “The Revolutionary Age” , episode 4 “The Reformation”, episode 3 “The Renaissance”, episode 2 “The Middle Ages,”, and episode 1 “The Roman Age,” .